I've always been a fan of Jim Beam and the brands they own, even though for whiskey connoisseurs, they are often looked down upon as being too big for their britches. But hey, I'm a fan. 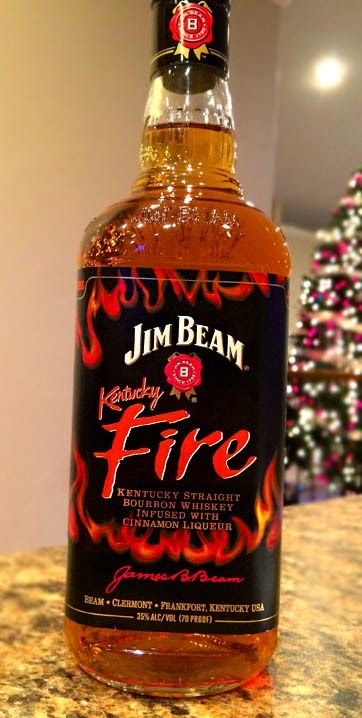 Regardless, let's have a look at Jim Beam's newest flavored bourbon, Kentucky Fire! Jim Beam's Kentucky Fire is a straight bourbon whiskey infused with cinnamon liqueur. It comes in at 70 Proof, which is kind of the standard for flavored spirits (especially vodkas), even though it's slightly less than the usual 80 Proof for regular whiskeys. Jim Beam Kentucky Fire has aromas of very strong, sweet cinnamon followed by a decent hit of vanilla, and hints of black pepper. Tasting brings flavors of sweet vanilla and caramel first, with a light bit of oak and wood, and a sweet and spicy cinnamon finish that seems to linger for days. This most closely reminds me of Firewater Cinnamon Schnapps with some Jim Beam essence thrown into the mix. This tastes more like a strong cinnamon schnapps than whiskey, but if you read through a bunch of my reviews, you'll see I've always been a huge fan of cinnamon schnapps. So for me, it makes a welcome combination! Straight whiskey is amazing, but sometimes you need a little something different, and Jim Beam Kentucky Fire is just that. It's been snowing here lately and this hits the spot for sure. I've been drinking it on the rocks and it's perfectly warming for the season. Go find some! Go checkout the good folks at Jim Beam. Tell 'em Bob sent ya! Drink This: if you like cinnamon A LOT or if you're just looking for an extra warming twist on a bourbon. Don't Drink This: if you're not alright with drinking something sweet. This is definitely on the sweeter end of things, but it balances out nice and strong with the cinnamon and bourbon notes.